, is so needed. It’s helping moms find relief from the pressure to get it all right. Welcome Jeannie to the blog. One of my favorite verses in all of Scripture has always been Romans 8:38-39. What I love most about this verse is how committed Paul appears to be in ensuring that we don’t miss the “nothing” part of this verse. Do you see it? He created a short but meaningful list of things that cannot separate us from God’s love. And yet, I am going to assume I am not the only one who reads verses like Romans 8:38–39 and still thinks, Surely it’s not that simple. Surely there is something we bring to the Cross that falls under the “everything but that” category. And you know what we do? We put a but right in the middle of Paul’s assurance. Now, maybe you put one big thing on that line. Or maybe you put several smaller things. Maybe you put both. Can we get uncomfortable for a moment? Can we pause here and be honest with ourselves about those small and big things we have been holding on to—the things we fear have piled up and built a wall between us and God’s love? Even as we read Paul’s assurance, we hurry to fill in that blank with the painful “truths” about ourselves, with our shortcomings, our sins, and our sorrows. In other words, we fill in that blank with all the things we believe make us unworthy of the welcome and affection of God. We fill in that blank with the “too dirty” things—the things that we believe are so deeply embedded into the fabric of our being that His blood cannot possibly reach, nonetheless wash clean, as white as snow (Isaiah 1:18). We don’t see ourselves through God’s lens of mercy and grace. Instead, we see ourselves exactly as the enemy would have us see ourselves—through the lens of condemnation and shame. Of course this doesn’t mean that our sin and rebellion don’t break the heart of God. They absolutely do. But because of Jesus, our sin and rebellion don’t make us less lovable to Him. That’s the difference! The truth is that because of Jesus, God is not mad at us. How do we know? Because He’s not mad at His Son. And when we are hidden in Christ, God loves us as He loves His Son (Romans 5:9–11). You, dear one—the one who fears she has disappointed God—you bring your heavenly Father great joy. 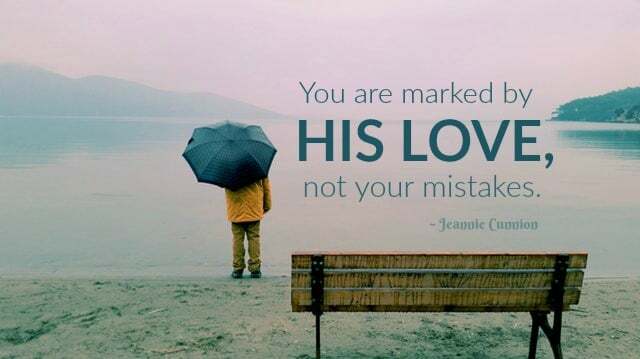 You are marked by His love—not by your mistakes, not by your failures, not by the sins you’ve committed or the sins committed against you. You are God’s deeply loved daughter. God, who sees into the deep recesses of our heart, welcomes us at our very worst. And by His grace, He changes our identity from rebellious sinner to radically loved friend of God (Romans 9:25). And here’s the beautiful thing. As the truth of God’s great grace penetrates and transforms our hearts, our desire to love God outweighs our desire to sin against Him. That’s what grace does. It makes our hearts break over the same things that break the heart of God. It melts the hardest hearts and inspires us, as new creations in Christ, to stumble toward authentic holiness through life in the Spirit (2 Corinthians 5:17). So I need you to know this. Whatever it is that you insert on that “nothing but _____” line, His grace is big enough (Ephesians 1:6–8). The Cross outweighs all of our offenses. The big ones. The little ones. And all the in-between ones. So we are free to get honest with ourselves about ourselves, and we are free to get honest with one another about whatever it is that makes us feel we are unworthy of God’s affection and unwelcome at His table. Jesus doesn’t offer us a “nothing but _____” kind of love. His is an “even that” kind of love.
. This is the book that will help moms parent in the confidence of God’s grace. 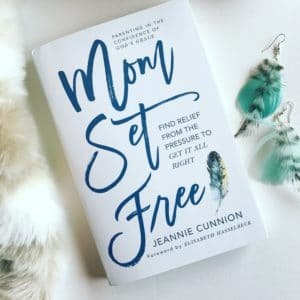 Mom Set Free should be the book that sits on every mother’s nightstand. Read this empowering message, and walk in the freedom you are made for. Our featured writer this week is LaToya Edwards. I loved her words of hope and encouragement for those desperate to find joy. P.S. If you’re a single mama, her words are written especially to you. Find LaToya here. Jennifer, I had not seen this book yet, so thank you for the heads up. Jeannie, I’m studying Romans 8 right now — just getting started on verses 1-11, but I’m going to need to find your book before I get to the end of Paul’s majestic words. Thanks for sharing it here, today! Michele, It is so, so good. I had the privilege of reading an early copy and offered my official endorsement of it. Jennifer, thank you for sharing this post. It’s transformational. Jeannie is a gem. The book is stellar. Such a treat to meet you Jeannie! Your words are a beautiful reminder today of how much I am loved. Your line “Jesus doesn’t offer us a “nothing but _____” kind of love. His is an “even that” kind of love.” is my favorite. Thank you Jennifer for opening up your space for Jeannie! Isn’t that line the best? It really hit me today. I’ve been saved since I was seven. I’m now 37. Been a good girl, followed the rules. I’m a mom and a wife. I play the Christian very well. But in the last year I have become at least ten things on the list of “bad things” in this post. And I’ve grown cold to even know how to change it. I needed the realness of this post. Thank you. We are so happy you stopped by, KJK. I don’t want to speak for God here, but I sense that He led you to this post for a reason, and he wants to bring you to wholeness. You are a treasure. I hope you know that! Thank you for this affirmation: “Our desire to love God outweighs our desire to sin against Him. That’s what grace does. It makes our hearts break over the same things that break the heart of God.” I had never considered that transformation being a “given” because of God’s grace. I also identified with the statement: We “stumble toward authentic holiness through life in the Spirit” (2 Corinthians 5:17). Praise God he appreciates even our stumbling efforts! Thank you, Jeannie, for reminding us: even though we’re imperfect, we still bring our heavenly Father great joy. Hallelujah! This book, the message…wow. I am adding it to my list but bumping it up. I struggle with (yes still…) negative self talk from where I mess up. Even when the mess ups may be worse and break my heart, I have a hard time getting past the fact I did it to begin with. Thank you for this moving post and sharing scripture. I love that the truth of God’s love sets us free. Interesting, I know and believe that nothing can separate me from God’s love yet I find myself hiding from God when I know I have come up short. Just like Adam and Eve, I hide. When I allow my sin or my humaness to stand between me and God I can’t feel his love but I know it is there. Great book recommendation. Wow and amen! This rings so true for me (and so many others!) How often do we believe God BUT….. Thank you for the encouragement to believe God. “Because of Jesus” – so grateful for His grace and His bearing my sin and bringing me into God’s gracious love. What a great message! How many times we fill in that bland with all of our flaws and failures. How great it is to know that NOTHING can separate us from the love of God!